Thaya and I had the amazing privilege of staying at Schoone Oordt in Swellendam again last week. They're running their annual #loveswellendam special and I'm gonna tell you all about, as well as what to do in the area. 2 nights for the price of 1, R2425 for a luxury room or R3435 for the honeymoon suite or family suite. Price is per room and not per person! All stays include an outstanding 3-course breakfast and high tea. Check my #loveswellendam highlight reel on Instagram to get an idea of activities to do in the area. Or let me just show you below! The service at Schoone Oordt is always spectacular, Fidney and Ian always make us feel like we're arriving home when we come to stay. We conveniently arrived just in time for high tea, so had a cup of green tea and a scone while our bags were taken to our rooms. 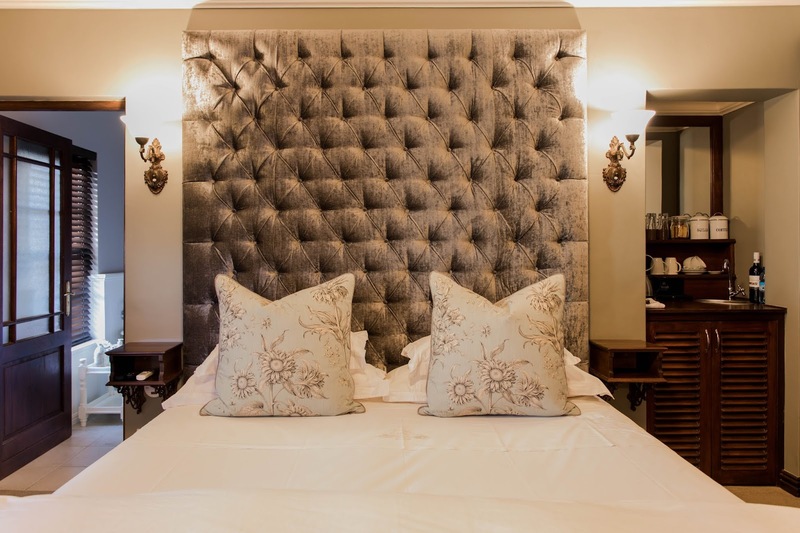 The rooms have recently been given a facelift and have just the most luxurious feel to them. The luxury rooms have these amazing new headboards, a vintage wardrobe, a tea & coffee bar, a little lounge, a king size bed, a bath & a shower, a basin for each person, underfloor heating and the most gorgeous locally made Rain products. Oh! And the carpets! The new plush carpets are a dream to walk on and I wish I had inner soles made from them. Heavenly. Alsion, the owner of the hotel, left us a bottle of MCC which we enjoyed as we got ready for dinner. The dams are full in Swellendam at the moment and I took the opportunity to do the most luxurious thing I can think of: have a bath by candlelight. It was amazing. I haven't had a bath in about 3 years, I'm more of a shower person, but I've really been craving a good soak lately. It was glorious. Alison had organised us a table at La Sosta. They hadn't even officially reopened yet. The new chefs have recently taken it over and were only opening the following week. I cannot stress enough what a beautiful and delicious experience this was. 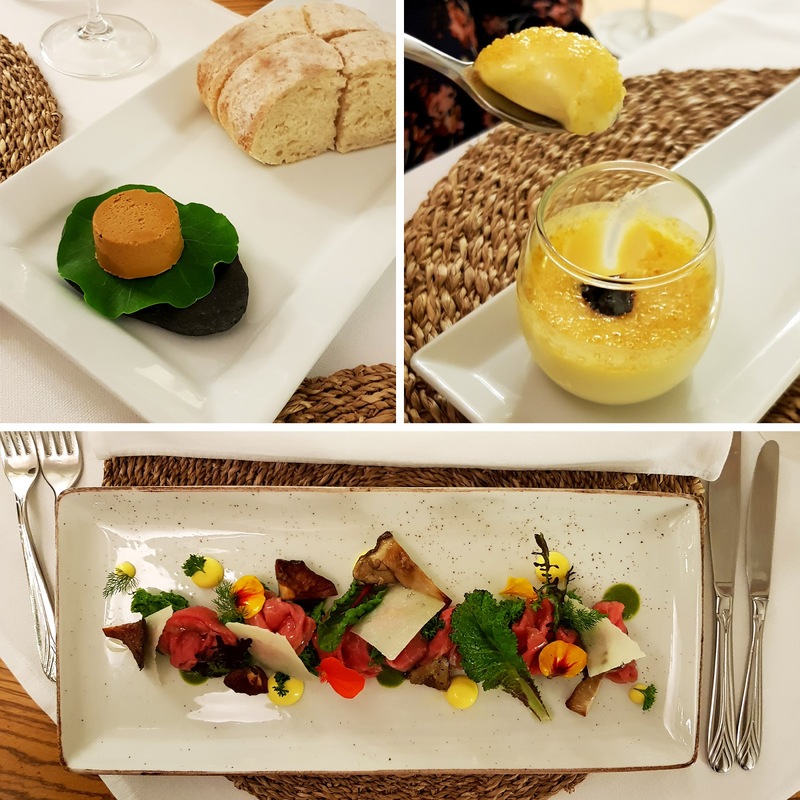 We started the meal with more MCC (obvs) and an amuse bouche of parmesan brulee, home baked bread with sundried tomato butter and I had the carpaccio served with local pine ring mushrooms. Thaya had the "Trota fumée" which is the smoked ocean trout. All the food was so beautifully presented. Thaya graciously let me choose the wine, La Sosta offers a number of local wines from the region and I just had to go with the Wild Yeast Chardonnay from Springfield, because it's irresistible. 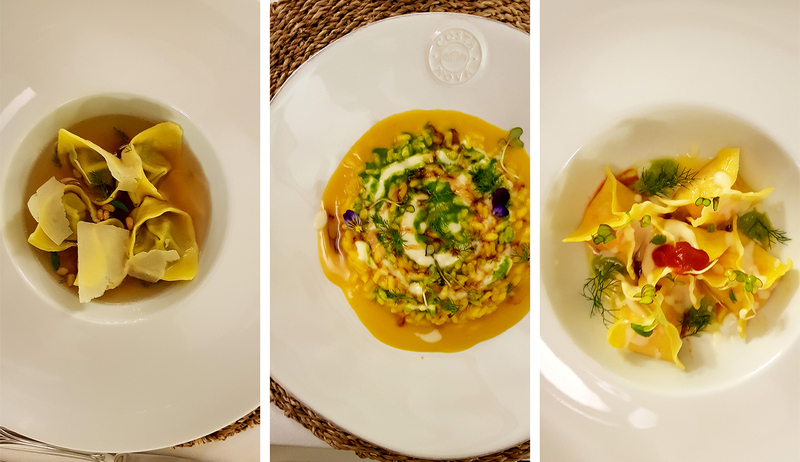 Our second starter was the "Tortello nel Bosco" a pasta filled with porcini mushrooms in a chicken broth for me and for Thaya, the "Fagotta Norvegese" a pasta filled with Norwegian salmon in a tomato-based sauce. We also just couldn't help but want to taste the Risotto too, so the saffron "alla Milanese" Risotto came after that. By this stage, I was starting to feel a little full, but we had to power on! I chose us a red blend called Jupiter by Kleinhoek Wines and it went beautifully with our mains. 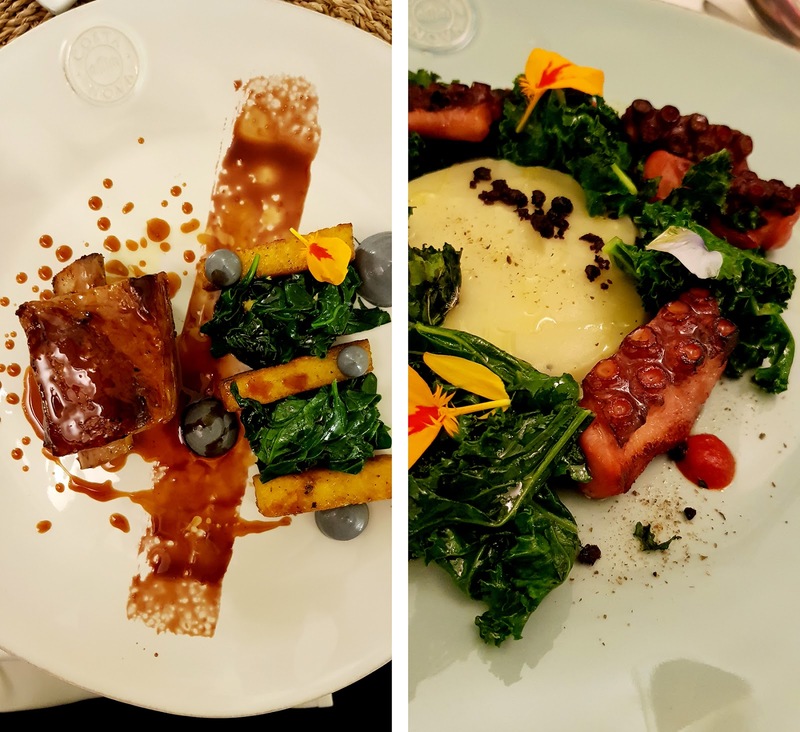 Thaya had the pan seared octopus with potato cream and caper powder and I had the beef short rib with baby spinach and black garlic mayonnaise. Dessert was a tiramisù and it was delightful. The whole evening at La Sosta was dreamy. Thaya and I rolled ourselves home and into hot waterbottle beds at Schoone Oordt to prepare for another foodie day in the morning. I'm busy illustrating the second book of our Florence and Watson empire. We debuted the theatrical show at the National Arts Festival in Makhanda in July this year. Florence and Watson present the Great Pangolin Mystery is a story about the dear PAngolin. The Pangolin is the worlds MOST trafficked mammal on the planet. That's pretty messed up. These shy nocturnal creatures are poached for their scales, which are made from keratin as well as their actual bodies. They are critically endangered, so we thought that we'd focus our second story on Pangy, the Pangolin. We're busy raising money by pre-selling copies of the book to donate money to the African Pangolin Working Group and to pay for our print run. 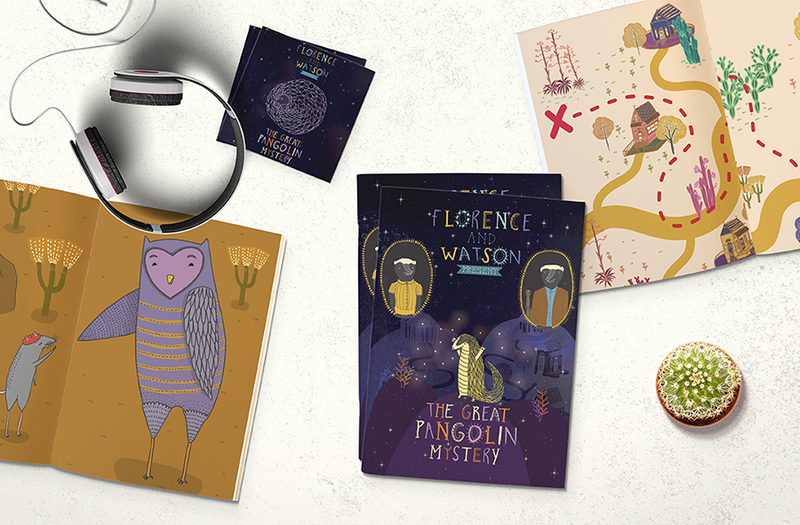 Our goal is to pre-sell 500 copies of Florence and Watson Present the Great Pangolin Mystery with an accompanying audiobook at R250 each. The usual book cost is R250 and an audiobook is R150. • R50 000 will go directly to the African Pangolin Working Group. • R10 000 will go towards the cost of 100 trilingual books of Florence and Watson and the Sugarbush Mouse, that we will be giving away to kids in need in the Eastern Cape when we do an isiXhosa reading of that book at the National Arts Festival at the beginning of July as well as other readings around South Africa. • R5000 will go towards general running costs such as credit card fees etc. You can find out more here and buy our book here. 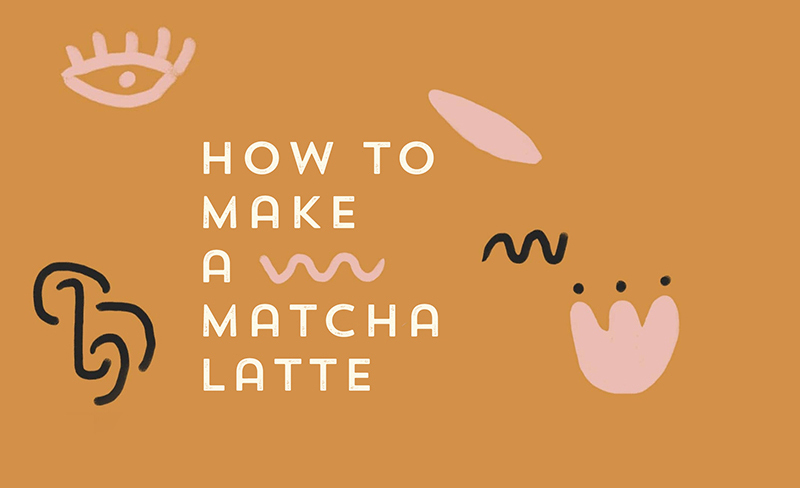 1: Place the water and matcha into your cup and give a little whisk. 3: Blend, pick a rad song, pour into your cup and Instagram it at the same time to be part of the club. A few years ago, I noticed that I would get very sneezy and snotty after drinking a coffee. I blamed this on the milk. I quit milk from my diet, but then I started getting the same reaction from other foods. Wheat, then legumes (peanuts are a legume btw, took me a while to realise why I was sneezing after making oaty peanut butter crunchies). Then it was gorgonzola and all other dairy, please god, not the cheese! So I read this as a mould allergy. It was pretty crappy. My favourite food is a creamy pasta, so it was a dark time. Lol. I would still eat the "illegal" foods every now and then and just make sure my Allergex and nasal spray were handy to help me through the fallout. Around this time, I decided to do a type of cleanse and try and wean myself off coffee. I was totally addicted to the bean and wanted to feel free from its grasp. I was only having one a day at the time but I really needed it to function. 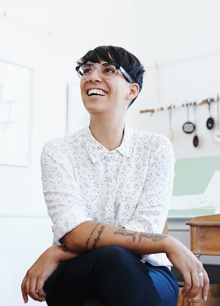 My friend Jessica Bonin of Lady Bonin tea asked me why I didn't try to switch over to matcha. So that's exactly what I did. It took me a couple of days to switch over without still needing a coffee, but eventually, I found myself not needing the coffee at all. I started sneaking some illegal foods back in and not having a reaction and would just think it was luck. Or perhaps I'd given it a break long enough and now it was fine to go back to it. One fine day, I decided to have an espresso just to get me through the day. My snotty sneezes came back with a vengeance. It was only then that I realised how long it had been since I last blew my nose. It was also at that moment that I made the connection to coffee. So I quit it for good. I'm on the tea train now and I couldn't be happier. I haven't had a cup of coffee in over a year and I don't have to drink matcha every day to function either. A good ol' cup of Enligh Breakfast sets me right. I've found that I'm a lot less anxious and irritable now that I've quit. So, if you've got the sneezy snotties, maybe cut coffee out for a bit. Perhaps google: "how coffee affects your adrenals and food allergies" if you want to understand more. There's also a lot of interesting stuff out there about L-Theanine which is found in matcha and other teas. This amino acid is found in rich amounts exclusively in tea, so that's pretty awesome.